The reviewer was introduced to the saga of Kydd and Renzi by the hardback edition of “Command”. Since then all the previous books in the series have been reviewed and this softback edition was nicely timed as a preparatory for the eight book due in October 2007. For any other reader coming into the saga with “Command” please seek out the previous books – it is well worth the effort. The softback edition will bring Kydd to a wider readership. It is released be midway between the publication of the hardback edition and the next hardback in the series. This book is the seventh in the series tracing the stories of two characters, Kydd and Renzi. Through the series from the first book, Stockwin has developed the characters and brought the reader firmly into their world. At the ending of this book the author is clearly already well on his way to continuing the story through the next book to follow “Command”. We now know that the eight book in the series will be “Kydd: The Admiral’s Daughter” and an extract from Chapter One of this next book concludes the new softback. It shows that Kydd is about to make a further rapid career gain. “Command” is a compelling story, filled with historical fact and with nicely drawn characters. In its own right, the storyline is a little odd because it is really two stories, a natural break appearing some two thirds of the way through the book, almost an engaging novel followed by an equally engaging but shorter work. The full impact may not be made until the reader continues into the next book when it becomes available. I look forward to reading that book because the author sets a new standard in the genre of Napoleonic War naval stories. The hero of the tale is Thomas Kydd, a press ganged wig maker who rises through the lower deck to a commission. With Command, he has reached the dizzy heights of Commander with his first command, the brig-sloop HMS Teazer operating from the newly taken island of Malta and into the Eastern Mediterranean. On receiving orders to Malta and his first command, he parts company with his friend Renzi who remains on HMS Tenacious. The author also made the rise from lower deck to quarter deck and although the ages were very different, his experiences provide him with insight into the challenges, joys, fears and frustrations of this experience. The Royal Navy has always been an organization of opportunity. There have been many over the centuries who have risen from the lowest rank to the highest, including one who not only survived a flogging round the Fleet, normally a barbaric death sentence, but continued his rise to the rank of Admiral. To those coming to naval stories for the first time there may be several things that seem strange but that is the way of the Navy. In recent times one Admiral was proud to tell people that he had reached his high rank as a result of being Court Marshalled. 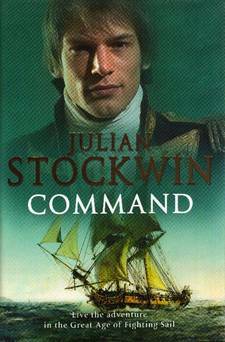 In his case he had reached a situation similar to that facing Kydd in “Command”. He had achieved his command just as the Royal Navy was about to be savagely cut by brain-dead politicians. He ran his ship aground and was sentenced to loss of seniority. That meant he missed the next cull of commanders and when he qualified for promotion again there was a shortage of people giving him a rapid promotion path. Had he not lost seniority he would have been retired from the Navy. The author provides a very engaging story and paints a strong picture of the historical situation. He also explains through the story the disadvantage of a rapid rise to Commander when unexpected peace puts Teazer into Ordinary and Kydd on the beach on half pay. The tale then changes pace and venue into a new story.